Have you ever wondered if you are trading the right market? What about the right strategy? Are you more cut out for a discretionary or a mechanical system? Do you have a tendency to take profits only to watch the stock move further in your favor? Have you tried just about every strategy/system out there with no success? 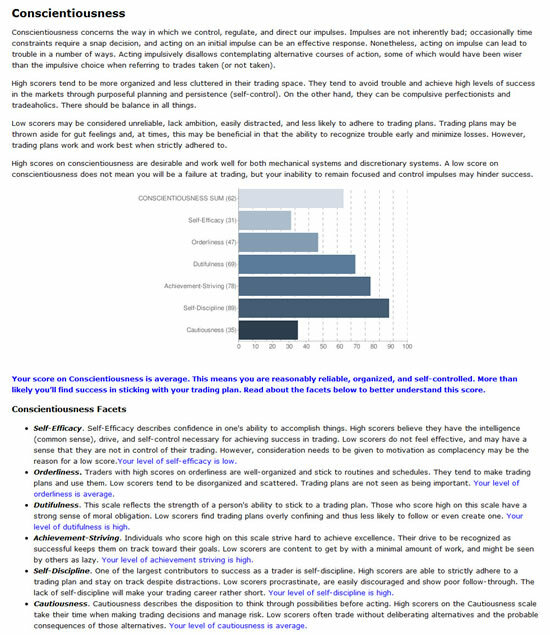 From the results you will be able to better understand how your personality can impact your trading. Here’s an example of one of the facets measured, conscientiousness. The MAP consists of 120 questions and will take about 20 minutes to answer. Your results are presented to you in both a narrative and graphical form. After you complete the MAP I will answer questions that you may have about the results via phone. I really want you to understand the importance of your results. The MAP is steeped in personal psychology and uses one of the most widely accepted assessments to measure personality. You will not be disappointed, I promise. Through the use of psychometrics, I’ve been helping hedge fund managers, proprietary traders, investment advisers, and self-directed investors successfully navigate the markets. A simple “passion to trade” will not last long in the markets; like a professional athlete, you need to train and know yourself well to make it happen. Those who arm themselves with knowledge about their personality and their own trading style increase the odds of becoming a more focused, disciplined, and successful market participant. I’m not here to sell you a trading system or blow smoke in your face about finding success in the markets. Let’s face it, it’s not easy to make a living in the markets. After taking the MAP you’ll know which characteristic traits of yours are helping your trading as well as those that are hurting your trading. I am here to offer my educational background and market experience to help YOU become the best market participant you can be. If you’re not satisfied with the MAP, let me know and I’ll refund your money. Plain and simple.